As a title, House has been recently hijacked by the medical profession, with its MD suffix and reference to the dying tradition of house calls. Long term horror fans, on the other hand, will know it as the moniker of a witty genre work from 1986 written by Monster Squad's Fred Dekker and directed by Warlock's Steve Miner, one that even gave birth to a short-lived franchise. But previous to this the title was owned by a 1977 Japanese film directed by Obayashi Nobuhiko, one that certainly qualifies as a horror film but which falls into so many other categories, including a few of its own invention, that actually classifying it in genre terms is a near impossible task. It's hard to resist trotting out a critical cliché and suggesting that you've never seen a film quite like House (or Hausu, the Japanese spelling of its very English title). But even if your viewing habits are varied and your relationship with eclectic cinema long-standing, I'm still willing to bet you've never seen anything quite like this. And unless you've spent a weekend in a haunted house with a bunch of lively Japanese schoolgirls after overdosing on teen comics and cinematic postmodernism and swallowing a Fear and Loathing sized cocktail of hallucinogenic drugs, I'm not sure you'll be able to imagine it either. You'll see drugs mentioned a lot in relation to the experience of watching this movie, and with good reason. One IMDb contributor even suggests that watching it after taking drugs might actually kill you. He may have a point. So how the hell do I go about describing it? Nothing is by the straightforward book here and I do mean nothing. This includes our main characters, an effervescent group of Japanese schoolgirls with English nicknames that reflect their character traits: there's musical Melody, kick-boxing Kung-Fu, daydreaming Fantasy, loveable Sweetie, and ever-hungry Mac (short for 'stomach' apparently), who are off to summer camp with dishy male teacher Mr. Togo. Unable to join them is their good friend Angel, who is instead looking forward to spending the summer with her widowed film composer father at his villa. But dad has a surprise for his devoted daughter – they're to be joined on their trip by his new girlfriend Ryoko, a glamorous creature whose neck scarf is kept fluttering by a special breeze that follows her around for this very purpose, even indoors. An immensely unhappy Angel decides instead to visit an auntie she's not seen since infancy. When the camping trip her friends were so looking forward to is unexpectedly cancelled, Angel invites them to join her instead, and the seven girls head off into the relaxing isolation of the country. Don't be fooled by the deceptive straightforwardness of the above summary. We've not got to the wild stuff yet, not by a long shot, but already we've been treated to tongue-in-cheek animated title sequence, a sugary-sweet parting of friends that plays almost like a Hello Kitty take on lesbian love, a balcony whose background is as stylised as the bridge set from Invaders From Mars, a cobbler and his daughter who bob to the soundtrack like background characters in a musical, a stop-motion downstairs tumble that wedges Mr. Togo's behind in a metal dish that a child then plays like a drum, a train journey presented in the style of a child's picture book, the romantic soft-edged circular framing of faces, oddball camera angles, freeze-frames, split screen, heavily colour-tinted imagery, and a family history realised as silent movie footage – complete with visible film sprockets, captions, jitter and frame burn – that the girls all comment on as if they're watching it in a cinema. And believe me, you ain't seen nothin' yet. As the girls settle in and Angel's welcoming, wheelchair-bound Auntie licks her lips at Mac's tasty plumpness, things gradually go from strange to bonkers. Mac disappears and her head turns up in a well in the garden, then flies about like a possessed mosquito and bites Fantasy on the behind, which sends her screaming indoors where her friends dismiss this as another one of her daydreams. She's further spooked when the newly invigorated Auntie disappears into the fridge, reappearing seconds later just feet from the camera to smile knowingly at the audience, then drift into a contented dance to a recurring tune that's accompanied here by musical cat meows. The madness builds to a mountain-range of peaks as the girls are individually possessed and ingested by whatever has been lying waiting in the house for their arrival: one is transformed into fire, another wedged into the mechanism of a clock, and in a thermonuclear explosion of audiovisual insanity that includes animated overlays, flying limbs, a dancing skeleton, dizzying camera moves, eye-popping process work and hand-drawn frame borders, a third is attacked and eaten by a piano. The potential for Mr. Togo to fulfil the role of knight in shining armour of Fantasy's cinematic daydream, meanwhile, is frustrated by city traffic and a bizarre botanic transformation resulting from his preference for bananas over watermelons. By the climax you'd be forgiven for thinking there was nowhere left for the film to go, but it goes there anyway, as half-explanations are delivered by a pair of giant floating lips, body parts float in a kaleidoscopic dance, and the surviving girls are assaulted by flying furniture, a martial arts geisha and a river of blood, a sequence that's shot and edited like a hyperactive acid trip. But while it may repeatedly seem as if first-time feature director Obayashi has taken leave of his senses, the care taken with which each inventively composed shot, colourfully artificial background and pre-digital effect makes it clear he knows exactly what he's doing. This stylised artificiality has its direct descendent in the cinema of Kamikaze Girls and Memories of Matsuko director Nakashima Tetsuya, but while the technique of Nakashima's films sometimes calls attention to itself at the expense of character and story (at least for this still undecided viewer), the technical wildness of House feels organically melded to both, a subjective approach that portrays events as they are perceived by characters who are too frightened, confused and emotionally involved to experience in a remotely objective manner. The result is a genuine mindfuck of a film, one whose energy, unbridled visual and aural creativity and manic sense of fun really do put it in a class of its own, and make it a prime candidate for cinematic rediscovery of the year. A clean anamorphic 1.55:1 transfer sourced from Toho's restoration that's a couple of notches shy of pin sharp, while the contrast and toned-down brightness are sometimes a little punishing on shadow detail – when a scene is dark here, it's really dark. An occasionally aggressive use of tinting (a technique that has really caught on in recent years) and a subdued palette elsewhere makes the accuracy of the colour reproduction hard to judge, though the brighter colours are certainly vivid when they need to be. A pleasing enough transfer otherwise, though, and the colourful psychedelia of the climax is most effectively captured. The Dolby 2.0 mono soundtrack is clear of damage but a little restricted in its dynamic range and distortion is evident on louder sounds, but the inventive sound design is still well enough served and even the quieter sounds (the unsubtitled calls for help on the other end of a phone line) are clearly audible. The meat of the extra features are eight interviews with some of the project's key personnel, their collective length being equal to that of the main feature. The story is picked up in Pitch (7:34), where Obayashi explains how the concept for the film came about (the quote at the top of the review will give you an idea) and how he came to direct it for Toho after none of the regular studio directors would touch it because it was deemed "too silly." In Script (15:24) Obayashi and his daughter Chigumi look back at the genesis of the script and expand on Chigumi's contribution – she was even given a credit as story originator and treated like a VIP when she visited the set. 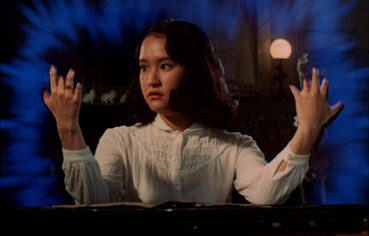 Some interesting stories about the production are recalled – one involving broken sunglasses and the lighting crew is rather nice – and Obayashi reveals much about his approach to the film when he says that "I want the cinema to be fun and full of dreams," and that the film could not have been made by adults alone and "needed a child's sensibility." Obayashi is back on his own for Pre-Release (15:37), where he outlines the specifics of the then revolutionary mixed media promotional campaign he devised – which included business cards and stickers based on the poster (created by animator Shimamura Tatso based on Obayashi's design), newspaper stories, interviews, a manga comic, a soundtrack record and even a radio play – to push the film even before Toho had agreed to make it. 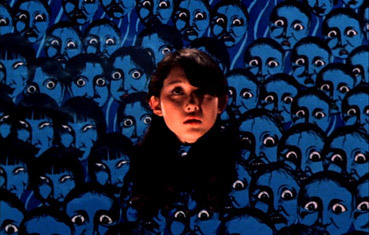 In Publicity (3:33), Tomiyama Shogo, the man put in charge of publicising the film's original release and now a successful producer in his own right, concisely outlines how House was originally promoted, particularly the use of Obayashi's poster design as a corporate image and the mixed media approach. In Casting & Production (20:22), Obayashi looks back with some affection at the process of casting relatively inexperienced young actresses, at the atmosphere on set and his efforts to break down divisions of labour, at how the new smaller Panavision cameras changed the way films were made, and at the interest generated by the pre-publicity with younger audiences who had lost interest in traditional Japanese cinema. Toho Studio representative Matsuoka Isao apparently told Obayashi "I've never seen such an incomprehensible script," and meant it as a compliment, while sound advice was provided by the then editor-in-chief of Japan's primo cinema magazine Kinema Junpo when he told the director: "Plenty of people can make ordinary films better than you. So make something that nobody else would." In Fantasy (2:13) actress Oba Kumiko – who played Fantasy – briefly recalls her work on the film, particularly a climax that involved being repeatedly soaked and having furniture thrown at her. Finally, in Release & Legacy (7:29) Obayashi muses on the legacy of the film, how it opened a door for other industry outsiders to direct studio productions, and how it ushered in an era of new young filmmakers like Kurosawa Kiyoshi, the acclaimed director of Cure and Tōkyō Sonata. Also included on the disc is the original Trailer (1:35), which gives a flavour of the film's creative madness, and a fine Booklet containing a detailed essay by Paul Roquet on Obayashi and the film itself, plus credits, stills and poster reproductions. Wild, weird and wonderful, House is the sort of first film that young aspiring auteurs everywhere (Obayashi, it should be noted, was close to forty when he made it) must dream of delivering, one that breaks all the rules, opens doors for other independent filmmakers, and is a big hit with it's target audience, all of which makes you wonder why it's not seen the light of day here for so long. No matter, it's here now and lives up to the excited enthusiasm of Eureka's pre-release publicity. Some may be surprised at its inclusion in the Masters of Cinema label, but I raise my glass to Eureka for looking beyond the realms of established classics and critical favourites to the sort of international outsider works that might otherwise be consigned to a paragraph in specialist volumes on international cinema. House is a joyous example of inspired cinematic madness that thirty years after it was first released still has the makings of an international cult favourite. Eureka's disc does well enough on picture and sound within the restrictions of the restoration, but really scores on the ground covered by the interviews and Paul Roquet's essay. It won't be for everyone, of that you can be sure, but if you like your outsider cinema adventurous with a touch of creative insanity, then this one is definitely for you. Enthusiastically recommended. The Japanese convention of surname first has been used for all Japanese names.